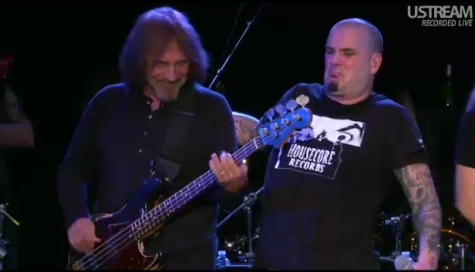 Philip Anselmo (Down, Pantera) and legendary Black Sabbath bassist Geezer Butler made a special guest appearances at the third installment of Samson's "Metal Masters" series, on Thursday, April 12, at the Key Club on the famed Sunset Strip in West Hollywood, California. Anselmo joined David Ellefson (Megadeth), Mike Portnoy (Dream Theater), Frank Bello (Anthrax), Charlie Benante (Anthrax),Kerry King (Slayer) and Chris Broderick (Megadeth) to perform Slayer's "Raining Blood" and "Angel Of Death" as well as the Pantera classics "A New Level", "Mouth For War", "Walk" and "This Love". Butler then got up on stage with all the other musicians to close out the night with a cover of Black Sabbath's "Hole In The Sky" - complete with Anselmo on lead vocals. Professionally filmed video footage of the entire event can be seen below.